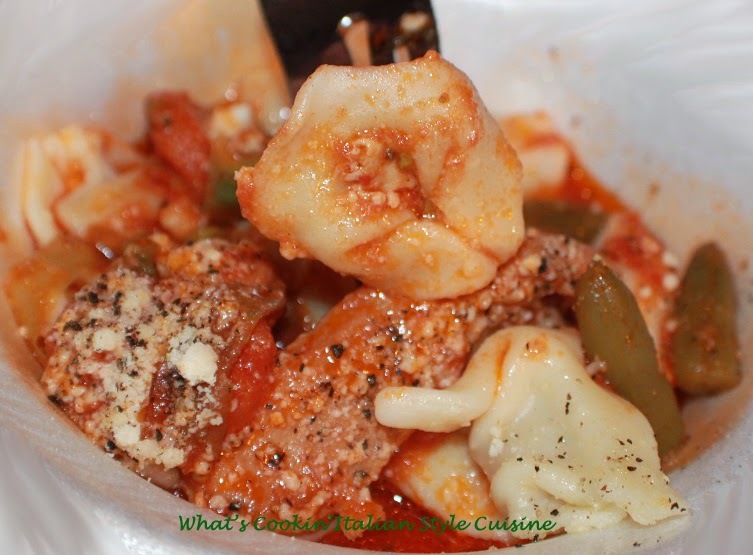 If you love tortellini, your in for a special treat. This is a chicken dish with vegetables totally cooked Italian style over this pasta. The sauce is amazing, the flavors all come together perfectly. Serve this with some garlic bread and salad and you will have everyone asking for it again! If your lucky enough to use all fresh vegetables this will be the best dish of the summer! Prepare pasta to cooking instructions, reduce the cooking time 3 minutes. In a large fry pan, add olive oil, brown chicken on both side, add squash, beans, peas and garlic. Saute' for 2 to 3 minutes more. Add tomatoes, wine, herbs all rest of seasonings. Cover and simmer for 30 minutes or until chicken is cooked through and no pink remains. Place the drained cooked tortellini in the chicken mixture and serve with a generous amount of grating cheese on top.